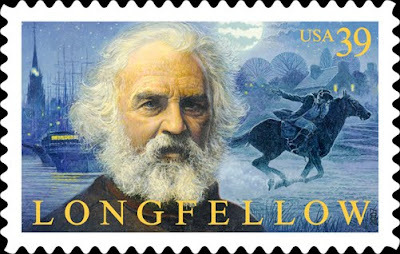 How Longfellow Woke the Dead, Jill Lepore, American Scholar, Spring 2011, 33-46. Paul Revere's Ride, first published in The Atlantic's January 1861 issue, "is a poem about waking the dead." The dead are Northerners and black slaves. Most readers above the age of 40 will recognize the phrases "Listen my children and you shall here/Of the midnight ride of Paul Revere. CWL doubts that most will under 40 years would readily place the author as Henry Wadsworth Longfellow. Lepore presents elements of Longfellow's The Witness to place light on the poet's intentions. In The Witnesses there are 'the bones of Slaves/They gleam from the abyss; They cry from yawing waves,"We are the Witnesses!" ' This theme of the dead giving testimony is is also in Revere's Ride. To put his work in a social context, Lepore uses Longfellow's other poems, his diaries, letters to and from his abolitionist friends including Senator Charles Sumner, a victim of a slaveholder's assault. In January 1861 Longfellow wrote in his diary, "The dissolution of the Union goes slowly on. Behind it all I hear the low murmur of the slaves, like the chorus in a Greek tragedy." Longfellow listened and heard the slaves humble chorus, a midnight message. To Subscribe to The Journal of the Civil War Era. Published Quarterly: Spring, Summer, Fall, and Winter. Or go to Drayton Hall, a local plantation hewn out of the Low Country landscape by hundreds of slaves, who also made its rice fields so profitable. At a clearing in the woods near the entrance, you see an information panel and a memorial arch: this was a “burying ground,” used at least as early as the 1790s, where the plantation’s slaves buried their dead. 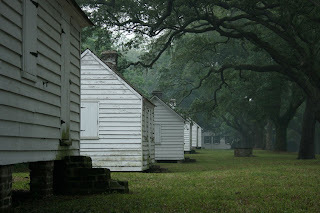 Or drive to Boone Hall, another local plantation, which you approach through an avenue of moss-draped ancient oaks that leads visitors to the main house: you see a row of rare brick slave dwellings, placed so no visitor could have missed the immense wealth in human chattel. At one time, these one-room homes were joined by others on each side of the road, creating corridors of the enslaved, ushering guests to the master’s domain. 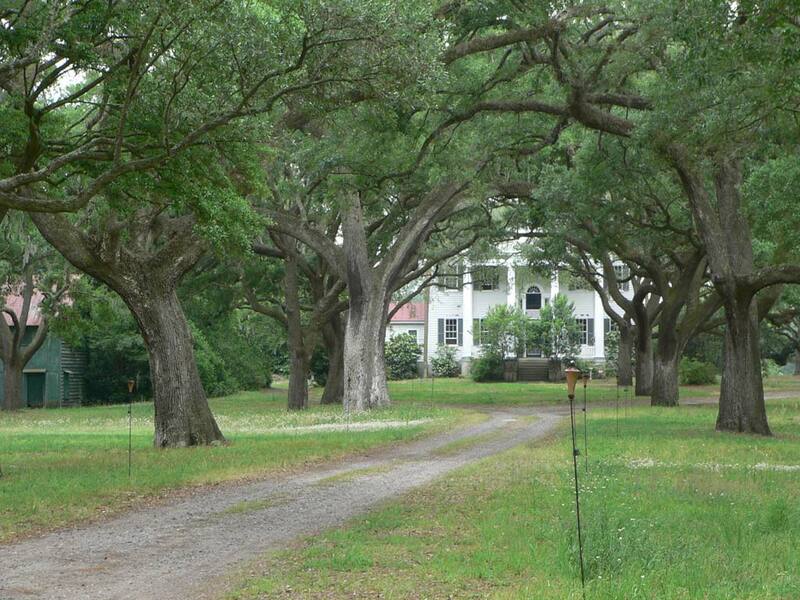 The house, together with the yards, we learn, “is referred to as an urban plantation.” And though Aiken was, by all accounts, an enlightened master (and an opponent of South Carolina’s secession), he was also the third-largest slaveholder in South Carolina. Slavery and its heritage are everywhere here. Charleston was one of the main colonial ports of the 18th century, dealing in rice, indigo and slaves. 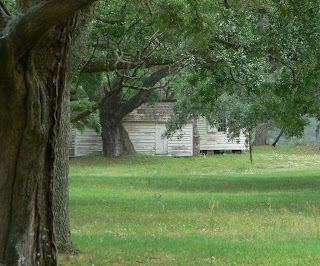 In 1860 South Carolina held as many slaves as Georgia and Virginia, which were at least twice its size. The genteel grace and European travels of its wealthy citizens were made possible by the enslavement of about half the population. The sesquicentennial of the Civil War that is about to be commemorated means that it has been nearly 150 years since American slavery was brought to an end. But even in the North, the subject is still approached with caution, delicacy and worry. It inspires profound shame, guilt, anger, recrimination and remorse, aimed in many directions for many reasons on both sides of a racial divide. . . . .
Slavery, he adds, was “simply not discussed within the family, or by employees, or with visitors to the Gardens.” Then, in 1991, a wood-frame house in which freed slaves had lived from the 1870s was restored as Eliza’s House, to show the living quarters that served generations of workers. In 2005 half of Eliza’s House was used to mount an exhibition still on display that tells the history of slavery and free black labor on the plantation, complete with the names and cost of each slave — some 2,600 people in all. The dedication of the black burial ground at Drayton Hall last October also suited a broader plan developed by the hall’s executive director, George W. McDaniel. 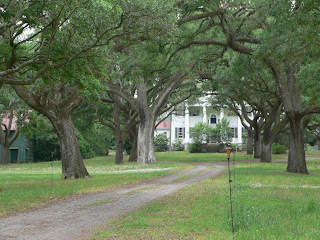 The plantation, now owned by the National Trust for Historic Preservation, does not only display its stunning Palladio-style house (which is meticulously unrestored), but also interprets the plantation with special attention to its slaveholding past. So out of a long tradition of silence has come a belated acknowledgment of slavery’s centrality and an attempt to explore it. But something more systematic is needed. The subject is far from neglected in the Charleston Museum, but neither is it fully addressed. The Avery Research Center for African American History and Culture at the College of Charleston plays an important role, but the difficulties are considerable, and not just because until recently the subject itself was not thought of as worthy of this kind of attention. Historians of slavery must track census data and demographic information, commercial records and archaeological finds. 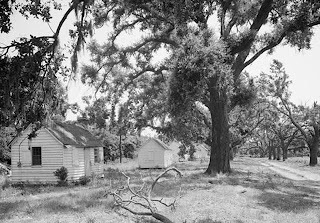 There are few surviving objects or dwellings, and aside from important oral histories, there is scant documentation from slaves themselves. At the beginning of the 20th century, in fact, the field was dominated by Southern historians who gave the institution of slavery a paternalistic veneer. It was only in the 1930s that the historian Frederic Bancroft began piecing together the evidence showing just how important the domestic slave trade was. And that meant, to put it mildly, that slave families and owner loyalties were far less secure than previously portrayed. The history has evolved since then, but it is still fitting that one of the most informative sites about slavery in Charleston is, despite its modest size and resources, a museum that focuses specifically on the slave trade and is housed in a building that during slavery’s last established years was one of the South’s primary slave markets: The Old Slave Mart Museum. Under the direction of Nichole Green, and with Elaine Nichols as curator, the museum, owned by the City of Charleston, is not a repository for objects, but a place where a narrative history is adroitly and soberly told, mostly on mounted wall panels. Part of that history is reflected in the building itself. The trans-Atlantic slave trade had been forbidden by Congress in 1807, but that meant that the domestic trade became all the more important. Between 1789 and 1865, we learn, more than a million American-born slaves were sold in the South. In Charleston, they were mainly sold outdoors, near the Old Exchange Building . But eventually there were complaints about crowds obstructing traffic, and, more important, perhaps, as tensions with the North increased, sales of human beings were attracting critical attention. The city banned outdoor slave sales near the Exchange after July 1, 1856. That was the very day that “Ryan’s Mart” opened indoors, becoming the most important showroom in Charleston. The museum doesn’t pretend to present a history of slavery, or an account of its abolition (though on the second floor, a traveling exhibition purchased from the Schomburg Center for Research in Black Culture, in New York, does address the subject). It simply chronicles the domestic trade. There is nothing here still redolent of such barter —the backyard prison, kitchen and outbuildings are long gone — but it doesn’t matter. The transformation of a slave showroom into a slave-trade museum gives a poignant edge to the account, in which an auction of slaves could resemble a sale of used cars. The most valuable workers sold for nearly $40,000 in 2007 dollars (a chart of costs is shown). Hundreds of slaves, it is evident, could be worth more than the plantation they worked on. We read, too, that most white Southerners didn’t even own slaves. But slavery’s presence was widely accepted as natural. Spend an hour here, and it starts to seem all the more remarkable that a museum has not undertaken a more ambitious examination of the subject. That will be one of the challenges for the National Museum of African American History and Culture in Washington, which is scheduled to open in 2015. In the meantime, remnants of slavery’s presence are so prevalent here that it becomes poignantly evident just how major an achievement is reflected by slavery’s enduring absence. 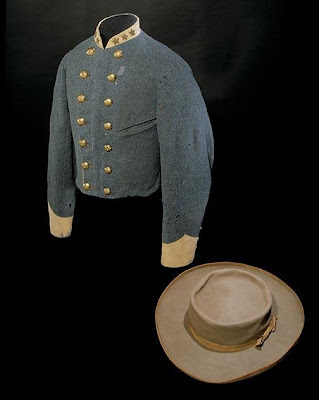 What has the Smithsonian put in storage until the Civil War's Sesquicentennial? John Singletom Mosby's waistcoat and hat. Today CWL received this email regarding the film Gods and Generals director's cut theatrical premier. The email notice came from Esther M. Turner who represents Journey Through Hallowed Ground. "Thank you for your interest in the Journey Through Hallowed Ground’s screening of the Directors Cut of Gods & Generals. I’ll add you to my Gods & General email list so when tickets are released you’ll be the first to know. I most certainly hope you can join us in Manassas, July 22 & 23. 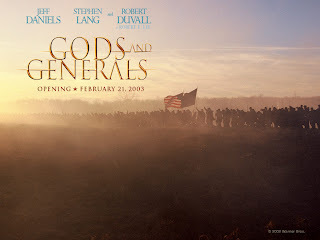 5:00 p.m. - 10:00 p.m.; Theatrical Premier: Director's Cut of Gods and Generals at the Hylton Performing Arts Center. Hosted by The Journey through Hallowed Ground Partnership. CWL has learned that Gods and Generals Director's Cut is 289 minutes which is seven minutes longer than Maxwell's film Gettysburg. 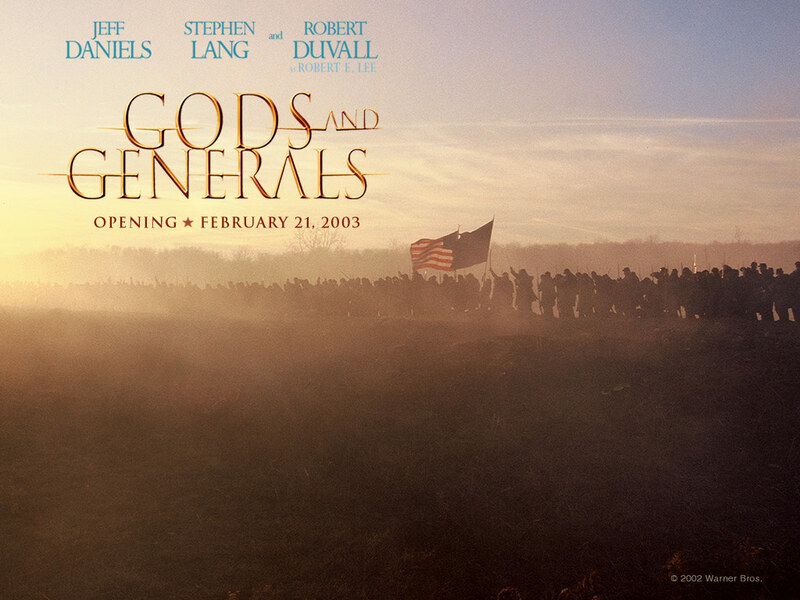 The director's cut of Gods and Generals will be available the third week of May and in BlueRay format. Decisions at Gettysburg: The Nineteen Critical Decisions That Defined the Campaign, Matt Spruill, University of Tennessee Press, 224 pages, paperback, $24.65. From the Publisher: The Campaign and Battle of Gettysburg have inspired scrutiny from virtually every angle. 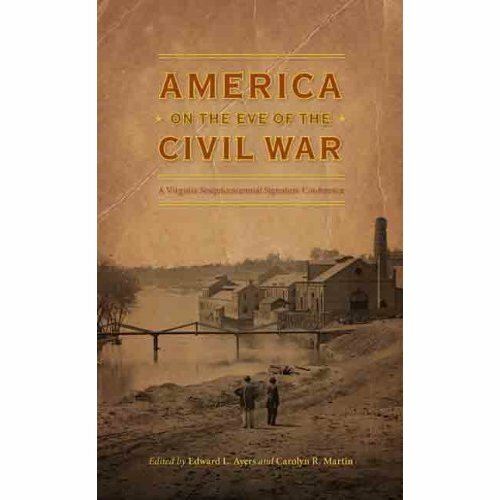 Standing out amid the voluminous scholarship, this book is not merely one more narrative history of the events that transpired before, during, and after those three momentous July days in southern Pennsylvania. Rather, it focuses on and analyzes nineteen critical decisions by Union and Confederate commanders that determined the particular ways in which those events unfolded. Matt Spruill, a retired U.S. Army colonel who studied and taught at the U. S. Army War College in Carlisle, Pennsylvania, contends that, among the many decisions made during any military campaign, a limited number—strategic, operational, tactical, organizational—make the difference, with subsequent decisions and circumstances proceeding from those defining moments. At Gettysburg, he contends, had any of the nineteen decisions he identifies not been made and/or another decision made in its stead, all sorts of events from those decision points on would have been different and the campaign and battle as we know it today would appear differently. The battle might have lasted two days or four days instead of three. The orientation of opposing forces might have been different. The battle could well have occurred away from Gettysburg rather than around the town. Whether Lee would have emerged the victor and Meade the vanquished remains an open question, but whatever the outcome, it was the particular decision-making delineated here that shaped the campaign that went into the history books. 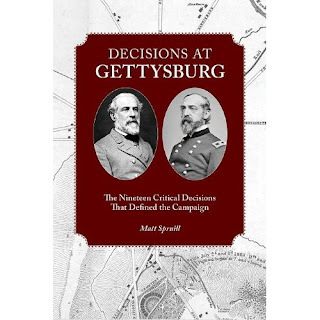 Along with his insightful analysis of the nineteen decisions, Spruill includes a valuable appendix that takes the battlefield visitor to the actual locations where the decisions were made or executed. This guide features excerpts from primary documents that further illuminate the ways in which the commanders saw situations on the ground and made their decisions accordingly. Matt Spruill is the author of five battlefield guide books, the most recent of which is Summer Thunder, which explores the deployment of artillery throughout the Battle of Gettysburg. He is a former licensed guide at the Gettysburg National Military Park. CWL owns and has used Spruill's guides. There are clearly written, contain accurate information, and are very walking and driving tour friendly. Spurill's Summer Thunder added new considerations to the discussion of the deployment and use of artillery at Gettysburg. 2:45 - 3:45 "Forgotten Elements of the Civil War"; James M. Bowen, William C. Davis, James I. Robertson, Jr. The conference's registration is $15 and the conference with lunch is $25. Lunch includes thoice choice of hamburger, chicken sandwich, pork barbeque sandwich, or hot dog, along with chips, fruit, and water or soft drink. The previous Virginia Sesquicentennial Commission's Signature Conferences were 1860: America on the Eve of the Civil War and Race, Slavery and the Civil War: The Tough Stuff of American History and Memory. These conferences proceedings are available on DVD and the first conference's proceedings have been published as a book. CWL has already registered for the event and recommends the first conferences proceedings which are an immersion into 1860. The speakers were limited to only speaking on what was known on December 31, 1860 and not allowed to use anything known of 1861-1865. It was a challenging endeavor that was well executed. CWL highly recommends the book and DVD of this conference. As yet CWL has not viewed the second conference's proceedings but looks forward to acquiring the DVD at the 2011 event. 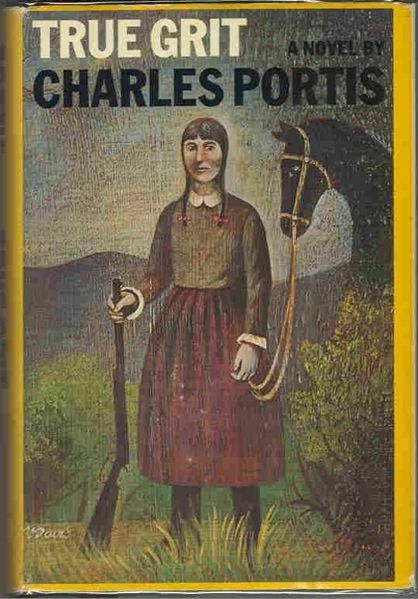 True Grit, Charles Portis, 1968, Overlook Press edition with and afterward by Donna Tartt, 2004, 235pp, $14.95. 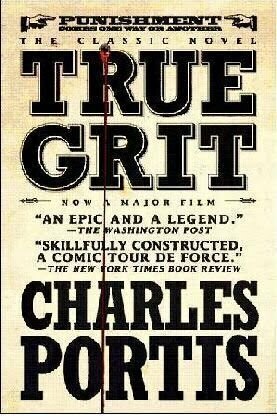 A bestseller when it was published in 1968, and the source document for two films, True Grit by Charles Portis is a masterpiece of short fiction and easily rests side by side with other first person monologue novels such as Huckleberry Finn, To Kill a Mockingbird, and Catcher in the Rye. True Grit, a version of which was serially published in The Saturday Evening Post, was very popular during the late 1960s and early 1970s. In 1969 Hollywood produced a film staring John Wayne and spun off a sequel in 1975 also staring John Wayne. A third 'further adventures of' film was made for television in 1975. The novel began to drift off the required reading lists of college freshmen. Joel and Ethan Coen filmed True Grit that stayed very close to the novel which moved back on to the bestseller lists during late 2010 and early 2011. The narrator is Maddie Ross, who in her 70s during the late 1920s, recounts her quest to seek vengance on the outlaw who killed her father, Frank Ross, when she was 14 years old in the 1870s. Tom Chaney murderer of a Texas senator, flees to Arkansas and murders Maddie's father there, then flees on Frank Ross' horse to the Indian country where he joins a band of bank robbers led by Lucky Ned Pepper. Familiar with the Bible when she is both young and old, Maddie Ross is a literate, strong-willed, and a quick to speak woman. Maddie Ross finds a deputy U.S. Marshall who, in the words of the local sheriff,is the meanest, most pitliless, double tough man who knows no fear and loves to pull a cork. Overweight and blind in one eye, Rooster Cogburn has a small arsenal of weapons strapped to himself and his horse. He has developed his law enforcement tactics under the tutelage of Quantrill, the notorious Confederate partisan. In Maddie's eyes, Cogburn possesses true grit. Maddie hires Cogburn Texas Ranger to capture Chaney. Cogburn is forced to accept the aid of Texas Ranger LaBoeuf, who is in pursuit of Chaney for his Texas murder. Maddie forces herself into the company of Cogburn andLeBoeuf. Each with very different motivations, the three ride into the Indian country to confront Ned Pepper's gang. By the end of the novel Ross, Cogburn and LaBoeuf have shared adventures, sustained injuries, and killed and desperados. In recent remarks in his History News Network column Jim Cullen quotes the opening line in the novel which is Maddie's remark that " 'People do not give it credence that a fourteen-year-old girl could leave home and go off in the wintertime to avenge her father's blood but it did not seem so strange then, although it did not happen every day,' . The magic of this novel is the way its compellingly strange language and narrator come to seem palpably real. It is the great achievement of True Grit that it evokes a moment in U.S. history in all its ordinary, extraordinary wonder.' "
Cullen's remark about 'the magic of this novel' may also be true of Shaara's Killer Angels. The compelling language of Shaara's novel, Shelby Foote's Shiloh, and Howard Bahr's Black Flower do evoke incidents in America's Civil War history which are both ordinary and extraordinary moments in warfare. Donna Tartt, author of The Secret History and reader on the True Grit audiobook, notes in her afterword in the 2004 edition of Portis' novel, that the story exists in an era when chivalry and the frontier coexist. Maddie's adventure occurs during a time when the Confederacy is past, Reconstruction is ending, and is narrated when Wild West shows are popular amusements are almost over, Woodrow Wilson has died and Al Smith is running from president. Maddie tell readers what she said in the 1870s and what she still holds true in the 1920s: "Men will live like billy goats if they are left alone" and "I would not put a thief in my mouth" when she refuses whiskey. Sources: Jim Cullen's Review of True Grit at the History News Network website. Donna Tartt's afterword is in the 2004 edition of the novel. An edited version of her afterword is found at the Language is A Virus website. The top image is of the 1968 hardcover edition; the bottom image is of the 2010 paperback edition in which is Donna Tartt's afterword. Short summary of SCV remarks at a reenactment of Jefferson Davis' inauguration on February 20, 2011. Notions presented: Southern history is besieged like Harry Potter is besieged in a recent movie. Regardless of whatever Confederate flag you [the audience] fly . . . anti-Confederate crowd will come at you [the audience]. During the sesquicentennial people will be getting information on the history of the South from an anti-Confederate crowd, the politically correct crowd such as MSNBC, USAToday or the Southern Poverty Law Center. The original Confederates are being treated as treasonous, as evil, as Nazis, and as terrorists and have been sent to the back of the bus like Rosa Parks was sent to the back of the bus [during the 1950s]. Southerners with Confederate ancestors must stop the lies and must free people from their ignorance of the Confederacy and from their narrow mindeness, bigoty and intolerance regarding the original Confederates. People of the Confederate states have been forced to the back of the bus. All we [the speaker and the audience] ask is to be left alone. 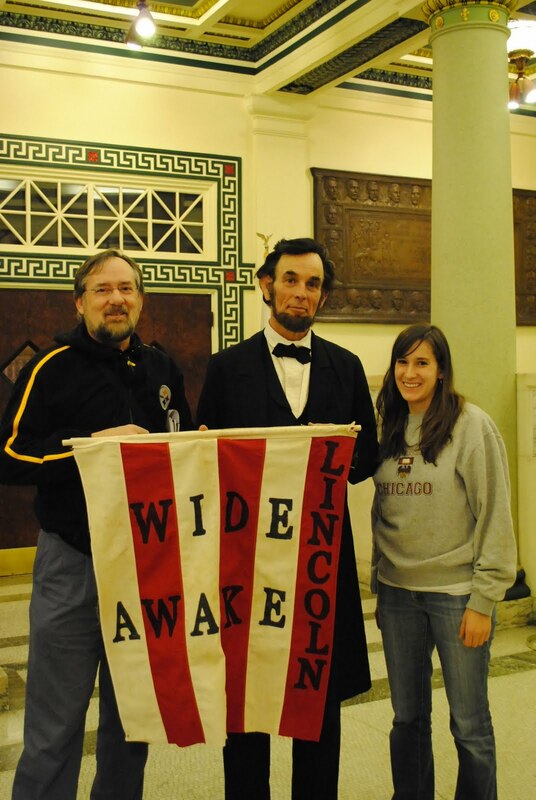 Sesquicentennial News---Abraham Lincoln/Fritz Klein Travels From Springfield to Washington, D.C.
February 14, 1861/2011. Abraham Lincoln visits Pittsburgh, Pennsylvania on the way to his inaugration March 4, 1861/2011. The location is Soldiers and Sailors National Museum, Pittsburgh, Pennsylvania. 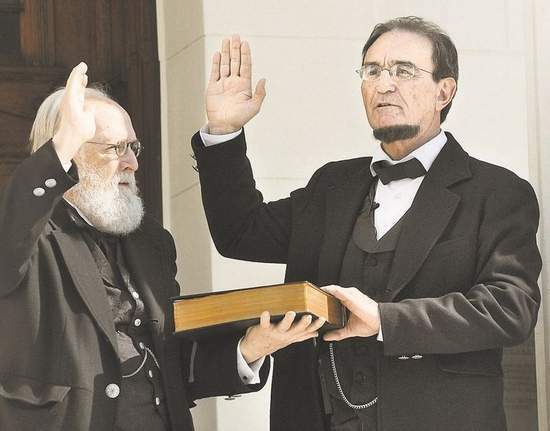 Fritz Klein portrayed Abraham Lincoln and did a spectacular job! With Fritz Klein is CWL and Lea Maureen Redd. The banner is a 2010 creation of a banner used by the Wide Awakes during the 1860 presidential campaign. The Wide Awakes formed in the spring of 1860 as bodyguards for Republican speakers during the campaign. In Pittsburgh, approximately 5,000 Wide Awakes paraded over two days in September 1860. The photograph was taken by Casey Patterson, program assistant of Soldiers and Sailors Museum.